Helllloooooooo and a very Happy Bank Holiday Monday to you. I thought I'd get ahead of myself and launch our May giveaway at the beginning of the month this time. 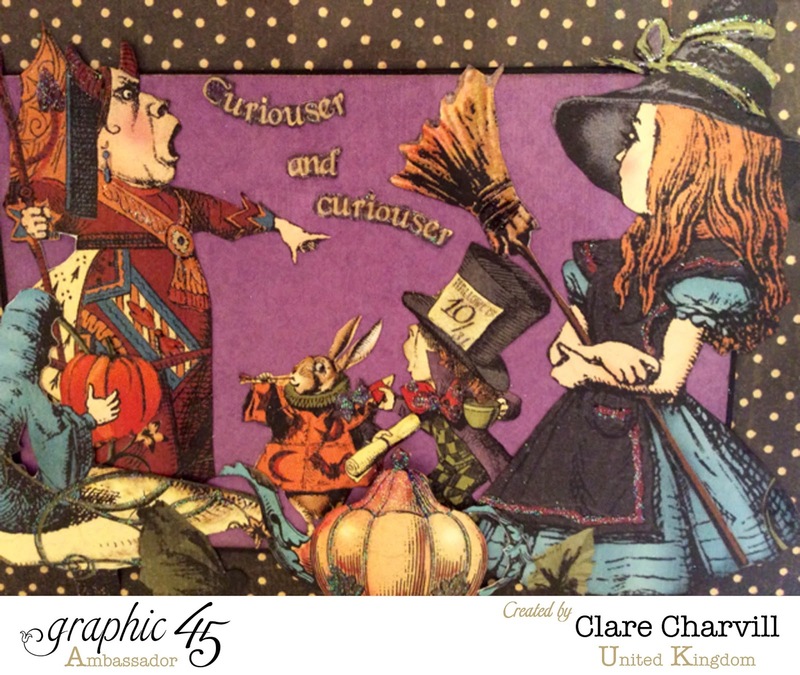 Carrying on the theme of the mini scrap books from yesterdays post I have an Alice In Wonderland themed one to give away to our winner this month. Using up leftovers from this fabulous paper collection with a twist by Graphic 45 I've added most of the main characters from the story to the cover. If you'd like to pre-order the collection to craft with yourself click here to go over to our website. Another lovely giveaway, hope no 2 is lucky this time!! What a lovely prize, thank you for the chance to win. I love this paper. Can't believe you still have it. Your books are always amazing. Thanks for offering the giveaway. Love the chance to win a piece of your beautiful work ! Wow Your book is just stunning , The G45 papers are really beautiful and full of color . I so hope you get somewhere and have a lovely day before you head home . Morning Clare, Wow !! Wow !! Wow !! my favourite of all time !! 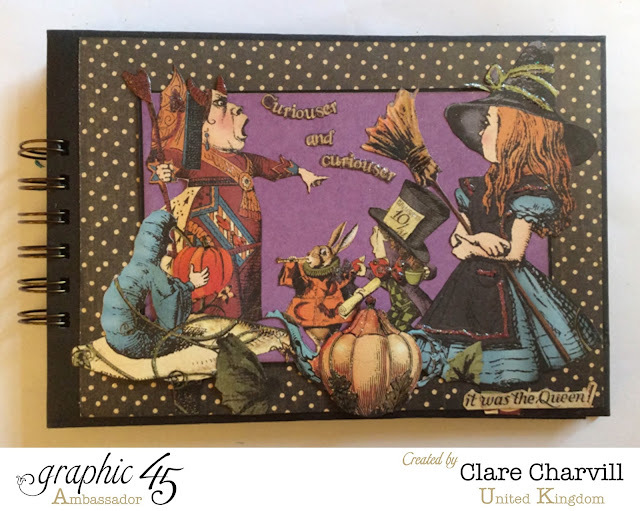 I love,love,love, all Alice in Wonderland themes and this little book is stunning,stunning,stunning, absolutely gorgeous papers, I love it !! As a MASSIVE Alice fan, it was fabulous to wake up to see this today! Gorgeous papers, and the way you use them is inspirational! I hadn't scrapbooked for 3.5 yrs, until I attended a workshop with you recently, and now not only do I have the bug back, but I am also trying styles very different to my usual, thanks to you! Stunning piece of work Clare - as always!! G45 papers are so inspirational. What an opportunity!! Amazing project, how lucky I would be to win this! This Graphic45 paper collection is wonderful. I love all your fussy cutting that you made for this album. Cross my fingers and hope to win. It would be wonderful to win this wee album! I have just finished making The Bureau and just love everything you do. All the best from New Zealand! Stunning album. Thank you for the chance to win it. What a stunning album. Love your work! Thank you for the chance to win, have a wonderful bank holiday. Such a cute little book. Thanks for the chance to win. Wonderful, as usual. Envy your creativity. Thanks for sharing and for your generosity for the give always. 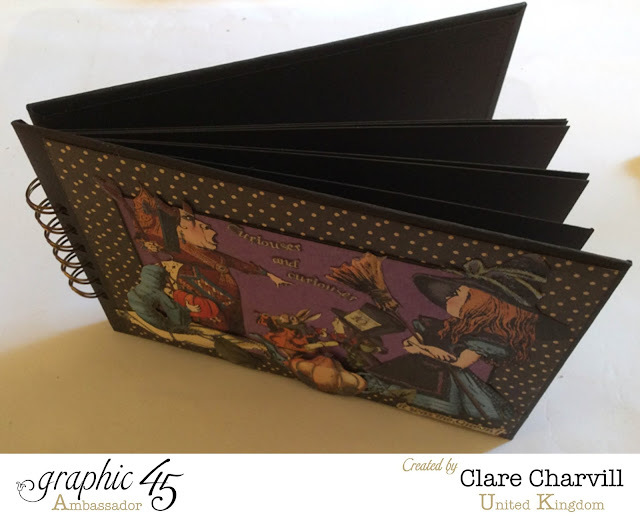 Beautiful papers,I just love graphic 45,thank you for the chance of winning this. Love, love, love your work!!! Beautiful mini (as usual), thanks for the chance to win! Love this little book and would love to win it!!! Thanks again for your inspiration Clare. Thanks for the chance to win this mini! Love this paperline!! Love it . I too need to use up my scraps and I think I will work on your idea and make some minis like these. I never though to make empty pages for people to store stuff in. Thank you for sharing. Always enjoy your videos. As always a beautiful creation Clare, thanks for the chance to win it. I can't wait for my collection to arrive later this month. Have a fab day. What a magnificent giveaway. I so admire those of you that can fussy cut all those intricate images and turn it into something beautiful. G45 is a great company and you've done them proud. Thank you so much for the chance. What a fun collection, Clare. Would love to win the prize. Many thanks for the inspiration. What an adorable book! I love Alice in Wonderland it's my favorite children's book. I would love to have one of your mini albums! Nice - thank you for the chance to win! Very nice book, so much talent shows through, thank you for the chance! Absolutely love your work. Would love a chance to win this! I love love this paper and LOVE your work as well! As always impressive workman ship.Thanks for sharing your talent. I have been a follower for years but seldom commented. I love the quiet, sure way you have of explaining a project as you go through it. You also introduced me to the idea of using black in my projects. Others may do it it, as well, but you really brought home to me the great effect of that touch of black. I would be so excited to have something you have made!!! Thank you for the opportunity. I've been watching you for a long time now. You've taught me so much about the process of making a mini album. I still have to practice. I'll never give up, I love them so much. It would an honor to be able win a piece of art that you've created. Thank you for giving us the chance to win a mini album created by you. Wow! What a fabulous book would love to win it! Love this book! I have to get this collection. One of my favorite paper pads. Great little mini album. Gorgeous book as always! Thanks for the giveaway. Thanks for the chance. Your work is always amazing. Thanks for the chance. and thanks as always for sharing. Great give away, good luck to everyone!!! That is such a pretty book. Thank you so much for a chance to win. Absolutely love the paper. I was not a scrapper the first time around. Thank you for the chance to win your wonderful album. Love your wonderful tutorials. Thanks. Love this book. Thanks for the chance to win it!!!! I like your projects and all G45 papers!!! Good afternoon Clare, and do hope you enjoyed your Bank Holiday Monday. I just love the little albums that you have been show-casing of late and OH! how I would love to be the lucky winner this time round. Thanks for generously offering this great prize and am sending a "Good Luck shout out" to all your many fans who take part. Take care. Hi Clare. Thank you for all your wonderful ideas and inspiration over the years. I have an addiction to graphic 45 paper as well, and am always amazed by your creativity. Keep up the great work. Sincerely Rita. A wonderful gift for a giveaway, I love Graphic 45's designs. Your album is delightful and I love this chance to win one. Thank you so much and Good Luck to all who enter. Thanks for a chance and inspirations! I love this paper! This looks to be another beautiful little album. Thank you for the chance to win. My best from Eagle River, Alaska, and good luck to us all. I love your albums. The papers used for this one are so vibrant and I would love to be in with a chance of winning it. Your tutorials are s helpful so thank you for sharing. Another giveaway!! : ) Hope I'm lucky this time! These papers are beautiful, I love your Albums, you have got me hooked. I love that paper collection! You always do such AWESOME work! thanks so much Clare for the chance to own one of your charming albums. You are such an excellent artist and teacher; it's a joy to watch your videos and tutorials. Hugs!! It is always a delight to see what you have made. You have some clever designs Thank you for the chance to win one. Love your blog and wonderful inspiration!!!! I have a couple of sheets of Alice paper I can't cut into because like your book they are so enchanting. Thank you for the chance to win something so delightful! Alice in wonderland is a classic . The book is adorable and depicts the characters beautifully. You do wonderful work . Love all your work, Clare!!! Thanks for the chance to win!! Beautiful collection, never seen this one before! Thank you for the chance to win! Thank you for giving us the opportunity to win this beautiful prize love your creativity thanks again. I love Alice and this album is fab! Love the look of this paper and book. Thanks for a fantastic weekend at Daisys. I think your albums are brilliant. The colours in this collection are my favourites. Thank you for giving us the chance to win it. Beautiful papers with loads of detail. Shown off to perfection on your little book. Hope i'm lucky. 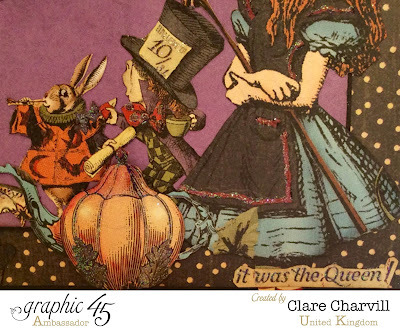 i love Alice in wonderland and love this collection. Love love this album. I enjoy very much watching your videos. Thank you for the opportunity to win this. Somehow I managed to miss this post when you first put it up. Fabulous mini book and so topical with the release of the new "Alice" film - thank you for a chance to win it. Clare you always create something fabulous and you always now what todo with your papers. You always have such unique projects. I love them all! Thak you for sharing them. Yet another "wow" creation Clare - love the papers and you always bring then to life!! !